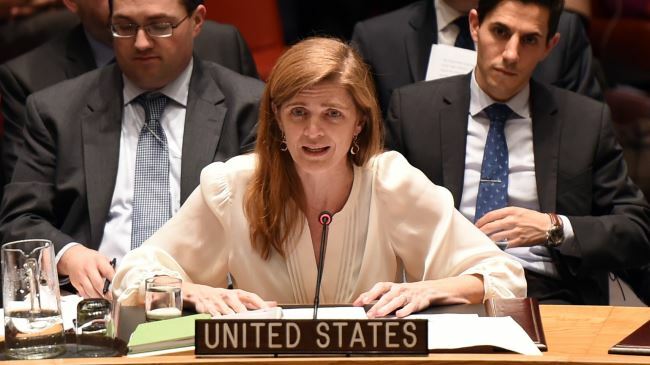 US Ambassador Samantha Power was one of only 2 to vote against Palestinian Statehood at the Security Council. The US (and Canada) are increasingly isolated. The UN security Council has rejected a bid by the Palestinians to end the occupation and recognize the State of Palestine. But it was close. Very close. And as a result, Israel, and its shrinking list of allies, including the USA and Canada, look more isolated than ever. There are 15 members of the Security Council, and a vote to admit would have required 9 “yes” votes. In the end, the motion got only 8 votes, one short. Two countries – the USA and Australia – voted against the motion – and another 5 abstained. Three permanent members of the Security Council – France, Russia and China all voted in favour. The UK abstained. One of the other abstainers was Nigeria which had been expected to support the motion. However, it was reported that last minute pressure by the USA induced it to change to “abstain”, which was the deciding factor. If the US had not suceeded in pressuring Nigeria, it might have been faced with deciding whether to use its “veto” power, which would have been even more awkward. If the issue could be decided by the UN General Assembly, where Israel is widely viewed as a “pariah” state, the Palestinians would win easily. Canada continues to use up its dwindling international capital by its efforts to protect Israel. Documents obtained by the Globe and Mail through access to information reveal that John Baird spent a lot of time lobbying foreign governments before the Palestinian bid before the General Assembly in 2012. Notwithstanding Baird’s intensive arm twisting, the Palestinians won overwhelmingly, leaving Canada one of only a handful of opposing countries. However Baird continues to stick to the Israeli line that Palestinian independence must be approved by Israel, a position which effectively gives Israel control over when or if Palestinian is recognized as a State. “Canada fundamentally believes that Palestinian statehood can only be a by-product of negotiations with the State of Israel,” said Foreign Minister John Baird in a press release. He apparently does not appreciate the irony in the fact that when Israel was admitted to the UN in 1949, the Palestinians were not even consulted. Posted in Canadian Politics, Palestinians, Statehood, USA Politics on January 1, 2015 by Peter Larson.